I’m inviting a discussion on the risks of showing all your sketch ideas for a logo design process. Logo development and design process posts are becoming more popular and are a valuable way to show your work in context. Reading about how other designers reach their final logo designs can be very enlightening to say the least, often showing the rest of us new ways to approach our own logo development. 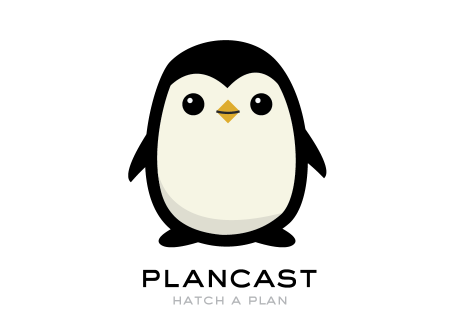 A recent example of a logo design process post is Plancast Penguin on Scott Hansen’s website, created by Alex Cornell. This is one awesome development post, well worth reading. You can see how many ideas and sketches that Scott puts out there for all to see. On one hand very very cool, but on the other, makes me nervous seeing so many excellent ideas of Scott’s not used, free for anyone to potentially copy, borrow or steal. 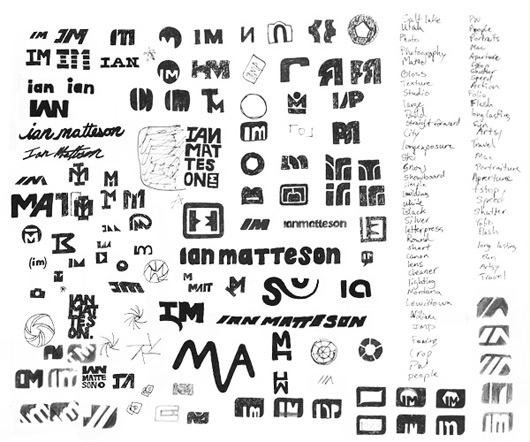 Also, another great example of a logo process post for Ian Matteson, is by Shelby White of Wanken. I love the end result so much, but just check out the variety of styles Shelby explored before settling on this great typographic option. As designers, we have to be careful, eyes everywhere to protect our final logo designs. It becomes a matter of urgency when we feel one of our own logo designs may have been copied or heavily inspired from. The logo process can be exhausting, lengthy and at times tedious and frustrating. We work to that final goal discarding any number of solid and curious ideas during brainstorming and sketching process. Any number of these ideas could be logos in their own right. I have many ideas and unused concepts littering my paste board. The odd successful logo design has been born from previously discarded ideas on other logo projects. I even have a special Illustrator file where I paste the more interesting unused ideas for future reference. Those of us that publish our sketches as part of a logo design process post for all to see, are baring our inner souls, showing the inner mechanisms that drive us to realise that final logo design. Any number of our sketches could be taken and used by others as a basis for a logo design in it’s own right. If we openly publish all these ideas and sketches for the world to see, are we then leaving our selves wide open to having our work taken from us? Not just the final design, but all those valuable ideas that are formed from our experience and skill. Ideas that had we kept to ourselves, would remain ours for future development. If you do publish logo process posts do you show all the sketch ideas or do you just show a select number of sketch ideas? Some months after you have published an in-depth logo design process post, you see a completed logo design in some inspiration gallery that clearly was taken from one of your sketches. Ironically, this logo design seems to have captured peoples imagination more than the logo you yourself created. So how would you feel? Would you care? If you did care, did you assume your sketch work should be protected as much as your final logo design? Or is it just fair game? Have you ever seen a logo design clearly inspired or copied from one of your sketches? Do you accept this could happen, that it’s a risk worth taking for being more professionally transparent? Or have you not even really considered it? Interested to see what think about this. Up and till recently, I have been a little guarded about my ideas and sketches. It’s painful enough to imagine a logo design being copied, let alone any number of these potentially valuable sketches. I am in two minds now, and will be posting a new logo design process post with some select sketches on newly complete logo project called ‘Keyboard Kahuna’, but certainly not all of them.